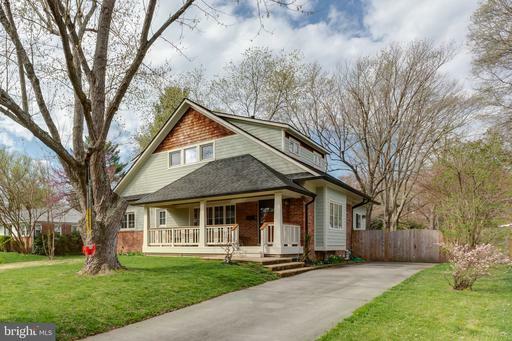 Stunning Craftsman in Hollin Hall Village complete with charming front porch! Main floor features an open concept flow with vaulted ceilings, a chefs kitchen with expansive island, new stainless steel appliance, and granite countertops. An inviting dining room, cozy sitting room, breakfast area, living room and two large level rooms with updated full bath finish the main level. Upstairs office complete with built-in desk, generous sized second bedroom, and a large light- filled master Level retreat with luxury claw foot soaking tub, double vanity, TOTO accessories, barn door, custom moldings, and hardwood floors throughout. Newly Carpeted basement is perfect for movie night, extra guest bedroom, full bath, workshop and laundry. Quality details throughout stay true to the Arts Crafts style. Waynewood Elementary Offers Due by 5pm Monday 4/15.